Life is but a race. And, in selling yourself your main competition is yourself. Sticking to the job of selling yourself, your persistence, is what makes you a winner. If you meet an obstacle or a problem along the way, tackle it; solve it, and then move on to the next. That way problems don’t become overwhelming. And, in clearing up one you may find that when you come to the next one it has already solved itself. Time solves an awful lot of problems. But, the best way to stick to it, to tell yourself that once is not enough, to get off the mat and come back for more, to develop the endurance you need to go the distance on your feet, is to remain persistent and go by that “step at a time” rule. I have a sign in my office that reads: “The elevator to health, happiness and success is out of order—you’ll have to use the stairs—one step at a time”. 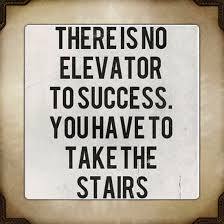 If you take things one step at a time it doesn’t matter if there’s an elevator in the building, that’s not working. As long as there are stairways leading to where you want to go, you’re in good shape. Just keep climbing. When you’re taking that “one step at a time” and your tired body and brain tell you “no” as you face the next step, tell your mind that “no” only means “maybe”. Maybe you can take that next step if you try. Maybe you can make it. Then, tell yourself that “maybe” only means “yes”. The minute you say “yes, I can do it”, you take that step and move on. It’s been said that those who are not busy, who are not struggling or striving—and that goes for success in selling yourself too—are simply busy dying. Hard work and persistence, sticking to the task you’ve set out to do, the task of selling yourself in more and better ways, is healthy. Hard work never caused the death of anyone. But, boredom, sitting around, wasting time, daydreaming and failing to push on and take things a step at a time are deadly. Persistence means being a leader in your own successful life, not a follower. Don’t follow trails, blaze them. Of course, that means you’ve got to know where you’re going. Another sign in my office reads: “The whole secret of life is to know what you want, to write it down and then commit yourself to accomplish it.” Early in my career I learned that mastering one’s way to the top can never be a part-time job. Half-hearted efforts get you nothing. Heading for whatever top you’re going after calls for a full time commitment and persistence. As I took the steps leading to success, I put forth not only a full time effort but overtime. Certainly there will be occasions when staying committed to your business or other goals will bring on periods of discouragement as well as moments of great satisfaction. It may often seem that for every two steps you take forward, you fall one step back. I know from personal experience that this can happen. But never dwell on a backward step, keep moving forward. Know what you want and commit yourself to getting it. Since the elevator is out of order, get where you’re going one step at a time. Deep-six the word no. No only means maybe and maybe always means yes. Take them a step at a time, stick to each of the rules, and be persistent. Soon you will begin to notice a change in yourself, a change for the better. You’ll feel good about yourself in ways you never felt before.